As a father of two boys who are literally growing by the millisecond, I am more aware than ever of how precious my time with them truly is. It feels like I’m in a Ferrari and I’m speeding down life’s highway and everything is just whizzing by my window like lampposts: Here, then gone in an instant. In order to “hit the brakes”, I sometimes find solace in going through our family pictures. There’s something profound about looking at a photo and allowing the imagery to transport you back to a happy memory. I like to think of it as recapturing some of the moments in my life that would have typically been lost in time. My wife enjoys putting together great picture combinations through creative methods such as photo albums, books and mugs. Like most families, we also have photos of some of our favorite memories strategically placed around the house. This way, visitors will not only get welcoming vibes, but ideally will really get a sense of who we are. Needless to say, I’m a huge fan of her work. So when I was contacted my fellow Connecticut blogger Michelle from A Dish of Daily Life about an opportunity to check out WeMontage, I didn’t hesitate! 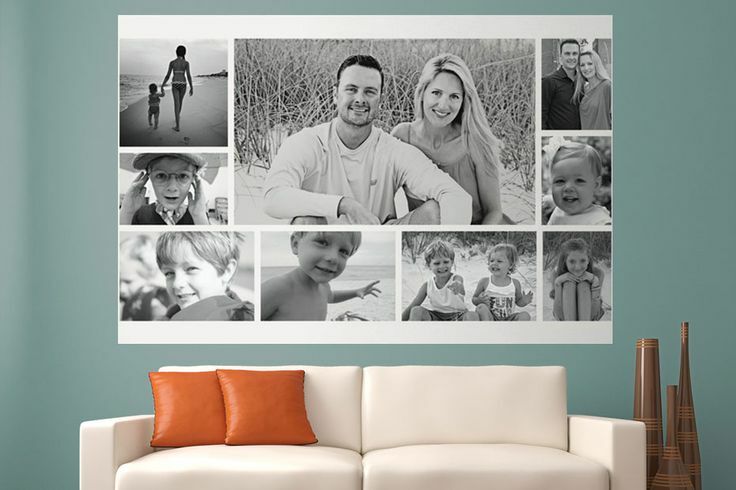 WeMontage is a fun, simple and innovative way to display some of your favorite photos by condensing them into a collage that is then printed as removable wallpaper. The fabric of the wallpaper is high quality and the adhesive is strong enough to stick to any wall over and over again, even on textured surfaces! I was given the opportunity to test out the site and create my own montage. First, I had to set up an account, which was super easy. From there, the user-friendly interface and allows you to upload pics from virtually any digital storage space you can think of such as your desktop, your Google account, Dropbox and more. You can take your pictures and start creating albums and choose from different system-generated montage combinations that are programed to optimize the visual quality of the photos. There is also a “settings” section that lets you choose the background color, (space between your photos) as well as the size. At this time, the minimum size that can be ordered is 6x 4 feet. However, I spoke with James and they are planning to launch a smaller, entry-level size of 3ft x 2ft in the near future. From about 4 different albums and over 70 pictures, we finally settled on about 20 photos from our wedding day. When our montage arrived, I eagerly opened the package and was very impressed with the quality of the pictures. The fabric of the wallpaper was smooth and thin, but very durable. This was put to the test when I, in all my wisdom, decided that I could put it up by myself. The montage ended up sticking to itself. I thought I was doomed, but I was able to pull it back to normal pretty quickly. Luckily my wife, who is a kindergarten teacher by trade, had a lot of experience putting up contact paper, so she lent and hand and provided a good strategy of sticking the one end of the montage to one side our dining room wall and slowly rolling it out to the other end. I again must give credit to my wife: if she wasn't around, I'd probably be wearing the montage right about now! Thin, smooth and most importantly, removable! If one picture is 1,000 words, how many do you think you can get out of these? Everyone who has visited our home since we put it up has been in awe of our WeMontage. They are also equally impressed with the cost and ease of ordering and installation. At only $10 per square foot, the price is definitely right. Imagine hanging 15- 20 photos on one wall. Then imagine having not only pay for the prints, but also for the frames (which is usually the most expensive part). You would also have to worry about hanging up the photos securely in order to prevent them from falling off the wall. All of these problems go away with WeMontage, as is it a safer, more ascetically pleasing and much less expensive than the alternative. Also for a limited time, you can use the code FATHERLY in order to save $50 on any WeMontage purchase. This coupon code is only good for one week, so take advantage of the savings while you can! There really is no limit to the personal or gifting potential of WeMontage. As long as you own the pictures, you can be creative as you like. Gift certificates are available one their website effective Wednesday, 8/29, so pick one up today! For more info (and great pictures), check out WeMontage on Facebook, Twitter and Pinterest! Question: What room would you set up your WeMontage in? Or, Who would you purchase a WeMontage for?